This infusion combines fresh flavors of berries, citrus, and herbs for a remarkably unique and refreshing detox water. I’ve loved using blueberries for a while now in my superfood smoothies, but this is the first time I’ve tried them in a detox water and I have to say – I’m impressed! The blueberries add a light berry sweetness that really compliments the stronger flavors of the orange and basil. Detox water isn’t just a delicious way to stay hydrated…some of the water soluble nutrients from the fruits and herbs are infused into the water along with the flavor! This gives detox water a nutritional edge over “normal water” in addition to all the amazing benefits you can expect from staying properly hydrated. With so many different detox water flavors and recipes, you’ll never get bored! Although you won’t be getting as many nutrients as actually consuming the fruits, it’s definitely a nice bonus. Fresh Tip: I try to let my detox waters infuse for at least 2 hours if possible. A longer infusion time gives a stronger flavor, but it also allows for more of the water soluble nutrients to get dissolved into the water! So what are some of the potential benefits of this refreshing detox drink? Blueberries are known for being especially high in antioxidants but what does that mean for you? It’s no secret that oranges are an excellent source of vitamin C which is crucial for a healthy immune system. But vitamin C also plays an important role in skin health. If the vitamin C from the oranges isn’t enough to keep you healthy this season, then the antibacterial compounds in basil will surely do the trick. Wash and dry the blueberries, orange, and basil. Remove the top and bottom of the orange and then slice into thin rounds. Fresh Tip: Keep it skinny! Thinly slicing your fruit or veggies helps to speed up the infusion process. It will make your water more flavorful and will absorb more nutrients faster! Add the blueberries, orange slices, and 2-3 sprigs of basil to a glass pitcher or beverage dispenser. You can enjoy immediately but the longer you let it infuse the stronger the flavor gets. If you want a stronger blueberry flavor, try lightly mashing the blueberries against the bottom or sides of your pitcher. Fresh Tip: Go light on the herbs. Fresh herbs like basil or mint can add a unique flavor and a variety of potential health benefits to your water, but they can quickly become overpowering. Start off with a small amount and go from there depending on your own tastes. This detox water recipe makes 2 liters (about 8 cups) but the flavor and nutrients will continue to infuse for about 2-3 days. I like to refill my detox water until it starts to lose flavor (usually 3-4 refills). I don’t recommend keeping a batch for longer than 4 days in the fridge or your fruit could start to go bad. Having a beverage dispenser makes detox waters super convenient. You just make a big batch, refill it as you need to, and you can use the spigot on the bottom to easily keep your glass full all day! Whether you use a pitcher or a dispenser to do your infusion, your infusion container should always be glass instead of plastic. This will prevent any acidic fruits like oranges or lemons from eating away at the container and releasing harmful chemicals into your detox water. You can even take detox waters on the go with you. I just use these glass bottles that I use for my smoothies and juices but they also make glass infusion bottles. These infusion bottles are made specifically for detox waters! 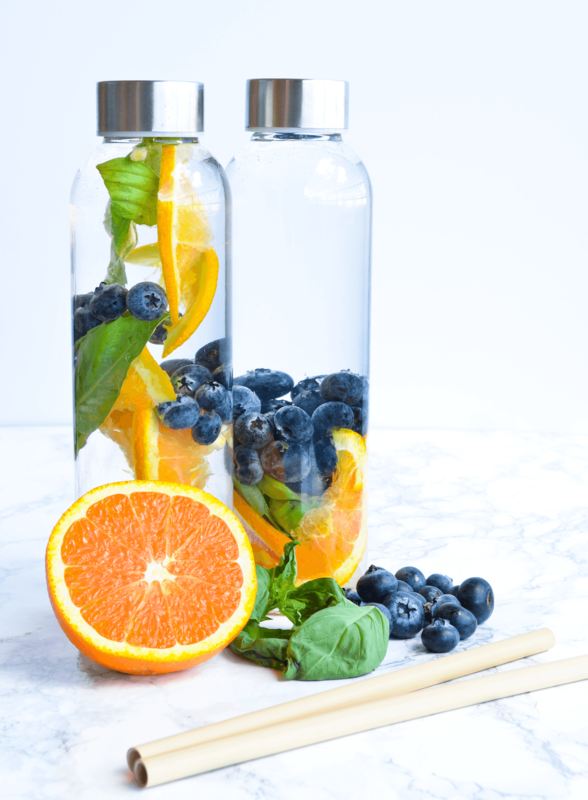 A blueberry detox water infused with radiant orange and aromatic basil that will leave you glowing! This infusion combines fresh flavors of berries, citrus, and herbs for a remarkably unique and refreshing detox water. I love the glass bottles you use for your detox water. Thanks for giving us the link! I will have to get some!